What's up, fuzz buddies? Are you ready to climb to the top of the highest tower of fuzz? Need to double your dose of dirt? We have you covered with the Spires. This two-channel fuzz combines the silicon version of our now-discontinued Dream Crusher with an updated and much-improved take on the Rosac Nü-Fuzz, without any of the drop-tuned seven strings, tight braids, or baggy Jnco jeans we now associate with the term "Nü-." How'd we get so lucky? 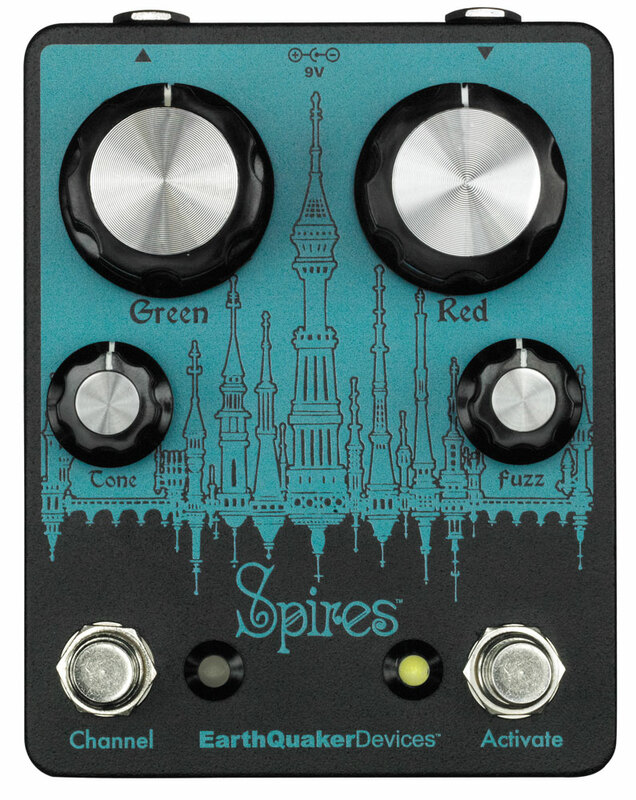 The Spires' controls are super simple: the giant knobs labeled "Red" and "Green" control the output volume of their respective channels, while the Red side's "Fuzz" control adjusts the gain for the Dream Crusher circuit, and the "Tone" knob on the Green side sets the thickness of the Nü-Fuzz to be anything from dark and heavy, to thin, brittle, and spitty. The gain on the Green channel is fixed, but we encourage you to try it with different pickups and volume settings on your guitar to unleash the beast, so to speak. The Spires was born from my need to have my big old Rosac Nu Fuzz and our now discontinued Dream Crusher on my pedalboard without taking up all the space. The green channel features a cranked fuzz inspired by the Rosac Electronic Nu-Fuzz, which, for all the unacquainted fuzz seekers, was released in 1968- decades prior to the dreaded “nü” prefix ever being uttered. The original schematic for Rosac Nu Fuzz is somewhat of a mystery so I used my original to make a “sonic copy” that is pretty much dead on. It is full-on fuzz all the time and uses crude wide range tone control to change the character from big and warm to sizzling and blown out. The original was slightly below unity at max so I gave this one plenty of output volume while retaining the original tone. The Red channel is a silicon version of the now discontinued Dream Crusher. There's no need to mourn the loss anymore. Dreams will still be crushed with walls of classic two transistor fuzz, only this time the crushing will be much more stable and less temperature sensitive. It features a very usable, dynamic Fuzz control and tons of output volume, just like the original. Each Spires is hand made one at a time by a white gloved team of professional experts in the dirty, dusty canyon of Akron, Ohio. Want a Spires of your own? Click Here!